Just when you thought it was safe to leave your doors unlocked and your windows unbarred, a film like Safe Neighborhood comes along and completely makes you rethink the home invasion sub-genre. It's been the format for a certain type of film for awhile now, and the formula involved has been generally left unaltered. Fortunately there are filmmakers like Chris Peckover who aren't satisfied with resting on the laurels of the typical, home invasion movie, and Safe Neighborhood quickly reveals itself to be something just enough on the fringe to make it noteworthy. It's also going to be an extremely challenging movie to speak about without giving away too many of the film's shocking reveals. But let's give it a shot anyway, tread carefully. 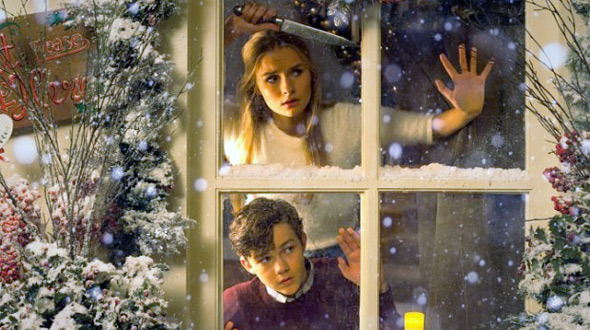 What you should know is that the film centers on two children, 12-year-old Luke (Levi Miller) and his babysitter, the slightly older Ashley (Olivia DeJonge). As Luke's parents (Virginia Madsen and Patrick Warburton) leave the pair alone for the night as they head off to a Christmas party, Luke vows to win over Ashley's love. Even though she is five years older than him, he believes love can win over all, even if that means putting down her current boyfriend. The night takes a turn towards the sinister, though, when Luke and Ashley begin hearing strange noises just outside, seeing strange shapes just past the frozen-over windows of the house, and then an unwanted guest gets inside the house. This is the challenge with speaking about a film like Safe Neighborhood, but it's also the benefit of seeing it as cold as possible (no pun intended). You're never quite sure where the danger is going to be lurking for Luke and Ashley or even what that danger is going to be once it finally reveals itself. Is it robbers knocking on the front door? Sadistic killers? Something even stranger? It's still early in the film when Safe Neighborhood lets us in on the little secret it has hidden up its sleeve, and the game of cat-and-mouse that follows is as intense and innovative as anything this certain sub-genre has ever delivered. Kudos to Peckover, who directed and co-wrote with Zack Kahn, for finding a simple remedy to the banality that slips into so many home invasion movies these days and completely committing. Safe Neighborhood has that twist-a-minute attitude that's been lacking from thrillers in general, let alone this sub-genre. They are simple twists, left turns in the film's story we don't see coming but that feel wholly organic to the story at hand. That main hook, though (you'll definitely know it when it hits) is what sets Safe Neighborhood apart from every, other film in the home invasion sub-genre, and it's a hook that I, for one, hope even the marketing for the film can get around without spoiling. Playing right along with those organic twists are the film's co-leads, and the young actors involved fully understand the tension and humor required of them. Miller and DeJonge act as kids would likely act in this type of situation, their attitudes with every twist and turn never losing that sense of a smirk with which Peckover's film seems to be dripping. Thank Warburton and supporting, child actor Ed Oxenbould, who plays Luke's best friend, for much of this, as well. They provide lighter moments within the film's darker tone, and, believe me, this film gets darker and even blacker as the minutes pass. Peckover accomplishes so much with his actors here as well as the confined spaces within the suburban home. Safe Neighborhood brings with it a healthy dose of claustrophia working for it, ratcheting up the suspense of the story all the more. Even after its left hook reveals itself, Safe Neighborhood continues its grip on your nerves all the way through to the film's final, shocking moments, and, yet, it still never loses that creepy side smile it's been casting your way the whole time. It's always refreshing to see someone try something new with a specific sub-genre, and, for all that it has to offer in every department required, Safe Neighborhood is a breath of fresh air the home invasion movie has been needing. Now this is it! Big blip on my RADAR.